This glamper is keeping it cosy. One vigorous Sunday afternoon snowshoe and the fire was lit, circa ’63 Singer humming and our ‘Go Coastal’ bunting production line underway. Loving the vintage bottle cap coastal fabric, boats and stripes that will adorn our 4M Go Glamping seaside packages this summer. Staying cosy in production. 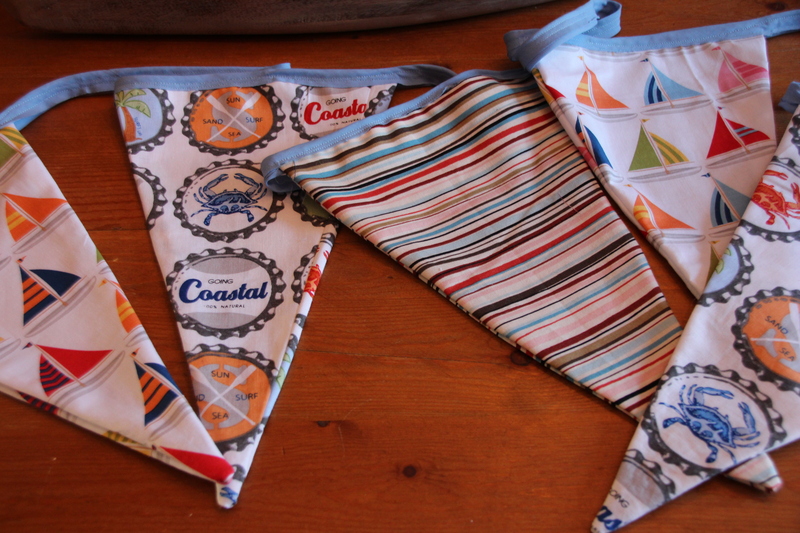 Go Coastal bunting for East Coast Glamping. Voila! Seaside on a string. Rissers Provincial Park: listen to the crashing waves, sun, surf and enjoy beachfront or electrical hook-ups at one of Nova Scotia’s most popular provincial park. Caribou Munroe Provincial Park: warm waters, sandy beaches and a nearby resort with a glampy dining room and unblemished view of the ferry headed to P.E.I. Graves Island Provincial Park: A short jaunt from beautiful villages of Mahone Bay and Chester, this park is ideally located for those looking to shop, dine, antique and enjoy South Shore day tripping. A view to sea and tales of a lighthouse named Peggy and a tragic accident – from King Neptune Campground. 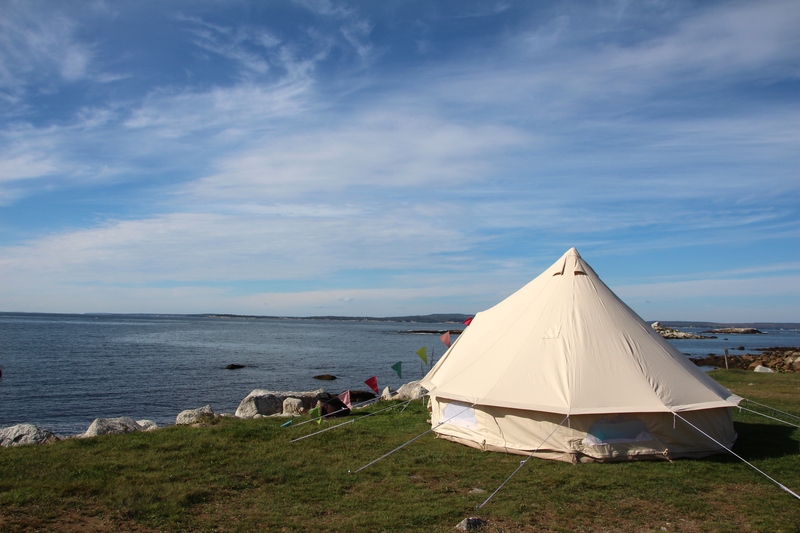 King Neptune Campground: Closest campground to Peggy’s Cove and stunning Atlantic views, this campground is a short stroll to Rhubarb Bistro and drive to the famous lighthouse and site of the Swiss Air Flight 111 memorial. Lunenburg Board of Trade Campground: While not directly on the ocean, this campground is ideally within minutes’ walk of Old Town Lunenburg, a UNESCO World Heritage Site. This hilltop campground provides serene views of the back harbour and views of the bustling front harbour from many sites. Cranberry Campground: Located over-looking beautiful Merigomish Harbour in Lower Barney’s River on the Northumberland Shore, this is a great location for day tripping the warm beaches of the North Humberland Strait and the areas many sites. A full listing of Nova Scotia campgrounds can be found on NovaScotia.com. 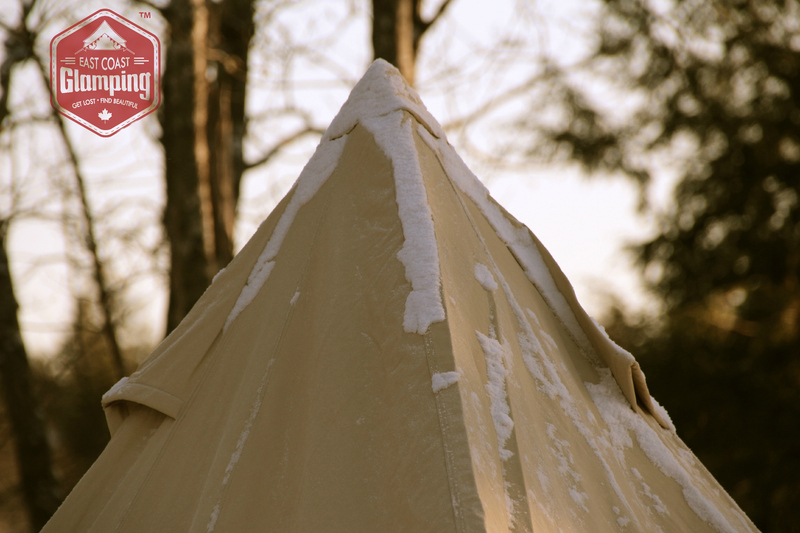 If you’d like more info on an East Coast Glamping package, send us an email or check out our website. We’d love to customize your unique glamping holiday.